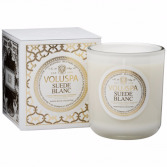 uede Blanc: Notes of Buttery Soft Sueded Leather, Rich Cedar. Our clean-burning coconut wax blend is ensconced in a thick, lustrous jar with a deep scoop base that creates elegant light from within. Rich colors adorn the crisp packaging, each intentional flourish reflecting the inspiration for the aroma inside. You’ll love using the jar for jewelry, flowers or decor long after the candle is gone. Burn time is approximately 80 hours. Poured with a luxurious, clean-burning coconut wax blend, the classic Maison Blanc candle is a story of fragrance written in wax and poured into an iconic decorative tin. 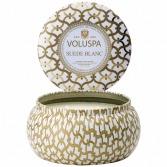 Suede Blanc: An exotic yet refined blend of buttery leather and rich cedar. Approx. dimensions 2 1/4"W x 4 1/2"H. 11 oz. Approx. burn time: 50 hours. 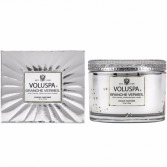 By Voluspa. 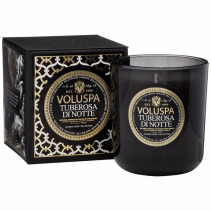 The modern-luxury candle redefined. Striking packaging and extraordinary scents. Handcrafted candle-making since 1999. Poured with a luxurious, clean-burning coconut wax blend. The classic Maison Noir candle is a story of fragrance written in wax and poured into a glowing noir glass. 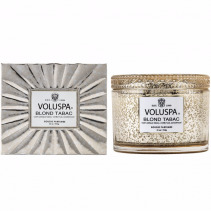 A creamy, white floral scent of night-blooming tuberose with a heart of agave nectar. 3 3/4"W x 4"H. 12 oz. Approx. burn time: 80 hours. 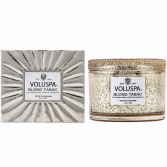 By Voluspa; made in the USA. Crane Flower: Notes of Bird of Paradise Nectar, Ripe Grapefruit, Geranium, Lavender. Our classic embossed glass jar design and proprietary coconut wax blend get an update with discerning Japanese inspiration. Beautiful hues glimmer as the flame illuminates delicate embossing. You’ll love using the jar for jewelry, flowers or decor long after the candle is gone. Burn time is approximately 100 hours. 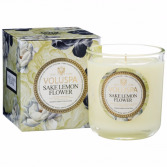 The Voluspa Japonica collection is filled with gorgeous floral designs and creative fragrances that take inspiration from the beauty of Japanese art. Each coconut wax candle is housed in a beautiful embossed glass holder and features a cotton wick for a clean, fragrant burn. 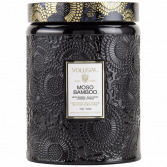 Moso Bamboo blends the bright notes of Moso bamboo, black musc and Japanese cypress. 16 oz. 100-hour burn time. 5"H with 12" circumference. 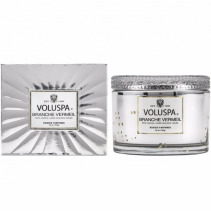 By Voluspa. Sake Lemon Flower: Notes of Tart Lemon Rind, Chilled Sake, Light Lemon Flower, Coconut Husk. Our clean-burning coconut wax is ensconced in a thick, lustrous jar with a deep scoop base that creates elegant light from within. The design adds fresh-cut ambience to any room with its floral palette and ombré hues. 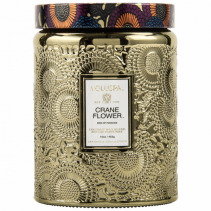 You’ll love using the jar for jewelry, flowers or decor long after the candle is gone. Burn time is approximately 80 hours. Flowers convey a message that cannot be put into words. PETALS FLORAL DESIGN & GIFTS of Wildwood, NJ provides a variety of fresh, fashionable floral designs to ensure that your gift is one of elegance and beauty. When you're looking for a unique hostess gift, token of appreciation or just a surprise to brighten someone's day, let PETALS FLORAL DESIGN & GIFTS customize and deliver one of our many fun, decorative & luxury gifts! We create dazzling presentations that are sure to please for any gift-giving occasion. To get your custom gift items, come by and see PETALS FLORAL DESIGN & GIFTS - your local Wildwood, NJ florist.